Other ‘projectile’ type weapons included the good old bow and arrow, the sling (made of cactus fibre thread) (pic 2) and the throwing lance - a simple wooden dart that could be hurled with the power of the human arm alone. Other hand-to-hand weapons included a long thrusting lance, equally studded with obsidian pieces and used to stab the enemy, and an ancient wooden club topped with a blunt ball that could fracture a man’s skull (pic 4). 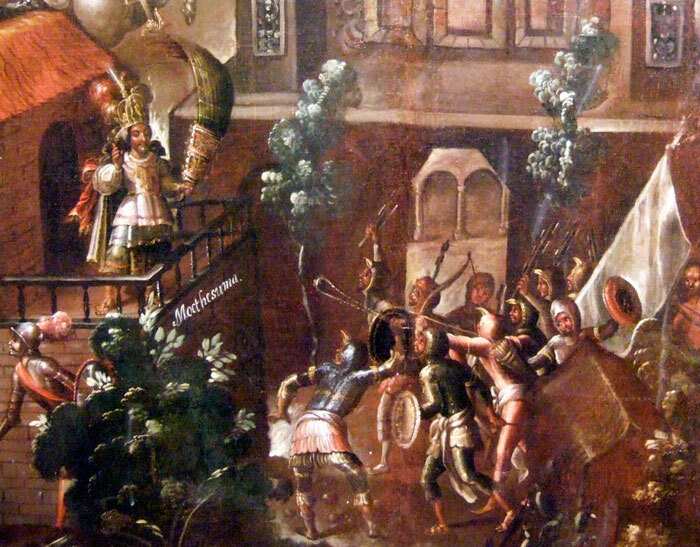 Remember that, whatever type of battle the Aztecs engaged in, their main objective was to capture enemy warriors (later to be victims of human sacrifice) rather than to kill them. 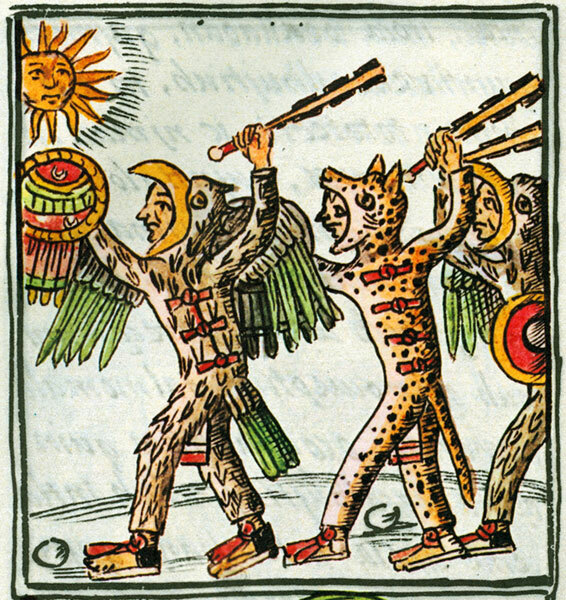 The Spanish, on the other hand, were quite happy just to ‘take out’ as many Aztec soldiers as they could, and they could always identify high-ranking Aztec warriors because of the magnificent costumes they wore. 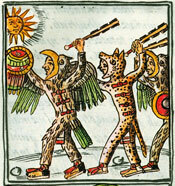 What were the strategies that the Aztec people use with the weapons? Mexicolore replies: We like to think we’ve covered all the main ones, but yes, there would have been plenty of others of secondary importance: farmers also used the tlaltepoztli, a hoe or spadelike tool with a metal base. Carpenters used plumbs for straightening, evening and polishing edges. Metalworkers used moulds (especially when employing the ‘lost-wax’ technique for making fine pieces of jewellery). Weavers used the backstrap loom (still used today in Mexico). Writers used cactus needles as quills. And so on...! 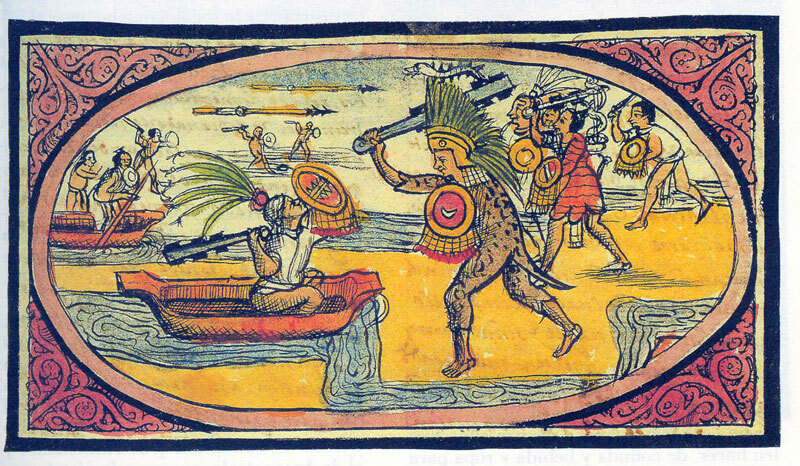 Did the Aztec Warriors use Machetes? (This is a school assignment so HELP ME) Also, Het is right; this site is cool. The teacher made us use this site and I have come to like it. I might research on my FREE TIME! 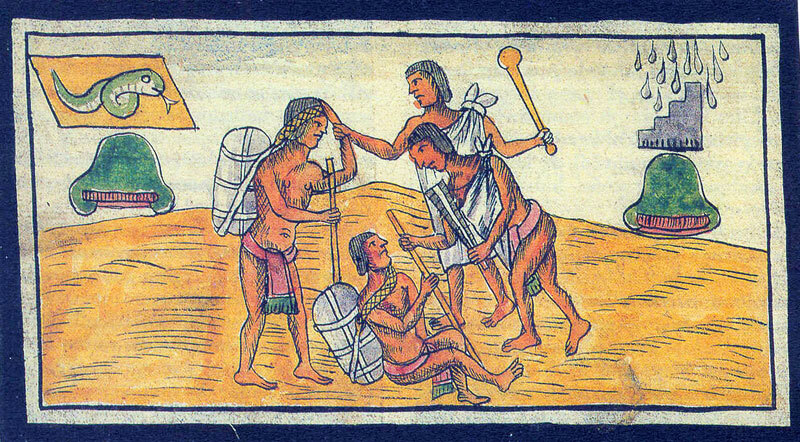 Mexicolore replies: Not machetes as they had no steel blades in those days. The closest would be the all-powerful maquahuitl (the obsidian-bladed broadsword, in either single-handed or double-handed versions). Nasty! Where did the Aztec find the materials that was sufficient enough to use for weapons. Mexicolore replies: Dozens of wars and hundreds of battles! For starters, three city-states alone were engaged in 75 years of almost continual warfare against the Aztec-led Empire of the Triple Alliance. Each new emperor - and there were a dozen or so - launched into a series of new campaigns lasting several years against kingdoms and city-states both near and far. 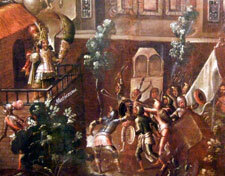 By the way, the Aztecs didn’t win every time: to give you one example, in 1480 the Aztec army was badly defeated by the neigbouring Tarascans - no Aztec emperor ever tried to take these fierce warriors on in battle again! Mexicolore replies: Thanks for writing, Tammy. Pictures are always a problem, especially if you’re looking for ‘the real thing’, ‘cos they rarely exist! That’s why we have to make do with pictures from codices, artists’ illustrations, photos of models, carvings, etc. 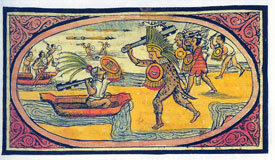 Just to give one example, there ARE no actual, original, Aztec weapons like the famous maquahuitl still around! Nice and informative article - the pictures were interesting too. It would be good to see pictures of the actual weapons up close too.